On March 23, 2018 workers at UTC Aerospace Systems in Everett, WA, who build landing gear for the 737, 747 and 767 tanker, voted overwhelmingly for union representation by IAM District 751. Below are a few excerpts from the latest edition of the District 751 Aero Mechanic. 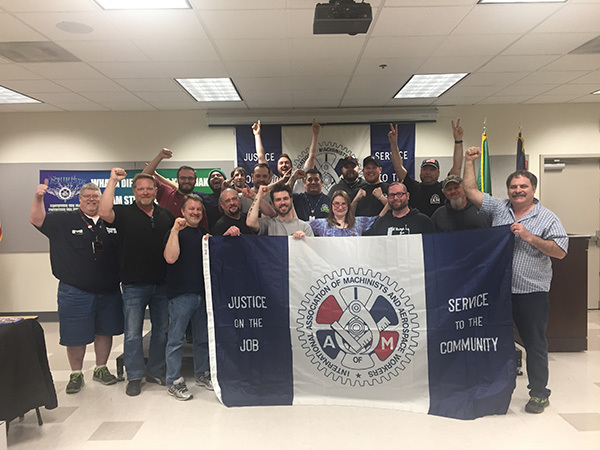 Workers at the UTC Everett plant approached IAM 751 about representation after news that UTC is buying out Rockwell Collins in a deal worth more than $30 billion. After several multi-billion dollar acquisitions, workers felt they needed protection and security for their families. Adrian Perez has worked for the company 14 years and worked in the landing gear shop for 5 years. Joshua Whitcomb, who has worked at UTC building landing gear for 12 years, echoed those sentiments. He takes tremendous pride in his work, has continually given 110 percent and is proud whenever a Boeing plane takes flight knowing he played a role in making the plane safe. The NLRB must still certify the results, but IAM 751 is moving forward to survey members to identify issues in their workplace. Read the District 751 Aero Mechanic article.